Posted on April 27, 2015	by Katy K.
Still on the “life getting out of hand” subject, I just realized that I never reviewed this book that I finished on Valentine’s Day, though it’s still one of my favorites so far this year. I’ll give it a try now, and hope for life to calm down enough for me to catch up on all the other books I’ve been reading. 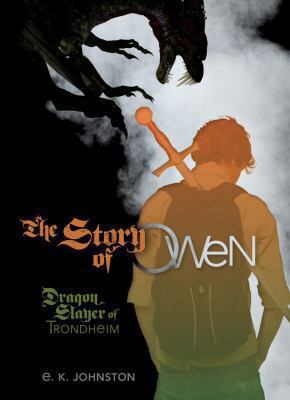 The Story of Owen: Dragon Slayer of Trondheim by E.K. Johnston. Carolrhoda Labs, 2014. It’s modern-day rural Ontario, in a world where dragons are real and dangerous. They eat carbon, and are likely to go after any large sources they can find – big factories and oil wells are naturally targets, but out in the country, a gasoline-fueled car is a likely target. Michigan was laid waste long ago, due to its too-heavy concentration of factories. (I would like to note for the record that Michigan is largely very productive farmland, despite its auto reputation. But it was still very chilling to read about it being inhabited only by dragons.) Dragon slayers mostly stay in big cities protecting the largest target, leaving those in smaller towns to fend for themselves. The titular Owen is the, son of two dragon slayers and mostly raised by his aunt and her wife – recently retired dragon slayer and sword smith now in the tiny rural town of Trondheim. Naturally, he’s in training to be a slayer himself, though he still has to go through high school. That’s where our narrator, Siobhan, meets him. Their relationship evolves from her just tutoring him in algebra, to her learning some of the basics of dragon slaying herself, so that she can be his official bard. Siobhan is a musician through and through, describing both events and people in musical terms – I loved her sequences trying to figure out which orchestral instrument would best represent a person she was getting to know. The Viking traditions brought into the modern day and combined with sort of normal high school social issues was an intoxicating combination. I liked Owen and especially Siobhan as characters, and other secondary characters – people that Siobhan had been inclined to ignore herself – were also fleshed out more fully over the course of the story. I appreciated, too, that while it was clearly high school and the things that teens like to do and adults don’t like them to do were there – drinking, parties, romance – Siobhan is only interested in Owen as a friend, and they’re both fine with this. Yes, I like a good romance – but I also like to see stories about friendship between people who aren’t necessarily interested in romance. All this would probably be background to someone who reads for plot more than I do – because there is an Exciting Plot, too. Dragon attacks have been ramping up dramatically, even in rural Ontario which shouldn’t have much to attract them, and teenagers in particular are going missing. Owen and Siobhan in particular take it upon themselves to solve the mystery, while trying to utilize their dragon-slaying skills and avoid being eaten themselves. This was highly satisfactory reading, so that even though I was saying yesterday that I should take a break from reading teen books for a bit now, I really, really want to read the sequel, Fire on the Prairie, which came out last month. An obvious pairing for this is the more lighthearted The Last Dragonslayer by Jasper Fforde, while Martin Berman-Gorvine’s Save the Dragons puts yet another spin on the modern-day dragon thing. Or head to Pern for music and dragons in a fantasy setting with Dragonsong by Anne McCaffrey. And now I need to go visit Ontario again. We took family vacations there growing up, from camping on the lake to the big road trip through Toronto and Ottawa and out to PEI. My Up with People cast went all over rural western Canada. Later, my love and I honeymooned in Stratford, and crossed the Bridge regularly to get British editions of the Harry Potter books. But that was when adults just needed a driver’s license and kids a birth certificate. We haven’t been back since they started asking for passports at the border, and I so miss it. This entry was posted in Books and tagged contemporary fantasy, dragons, musical fantasy, teen fantasy. Bookmark the permalink.